We cannot wait to see campers zooming around the 1,100 foot ‘Playland Speedway’ this summer! It hit us that campers love Uncle Gary’s golf cart! As he drives by they scream for rides and some campers even ask their parents to pick them up from camp early just so they can ride on the golf cart. What’s more fun than riding in a cart!? Driving one! We set off to research go-karts. Uncle Steve and Uncle Matt visited other camps with go-karts and spoke to other camp directors. 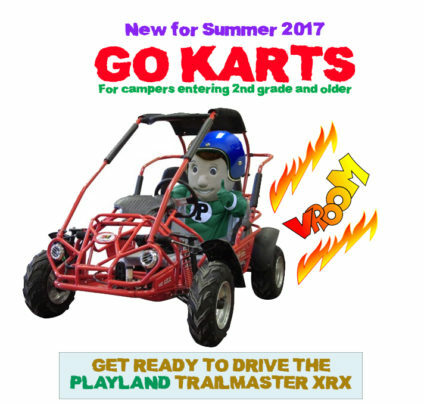 In order to move forward, we needed to make sure that go-karts fit the Playland philosophy: safe, fun and instructional. Safety – If camp is not safe, it’s worthless. The track we are designing will be have professional barriers, the same ones used by industry leaders. If a go-kart bumps into a barrier, the barrier will ensure the bump is soft and that the driver stays on course. While driving, campers will wear seat-belts, racing helmets and goggles. Additionally, the go-karts have adjustable speed. This way younger campers will not be able to go so fast, and while older campers will be able to go a bit faster, they still stay at a safe and controlled speed. Other camp directors let us know that go-karts are one of their most popular camp activities. We want campers to have the best summer ever! It’s a no brainer to invest in fun. Instructional – We want campers to learn something. Our counselors will help campers learn to be safe drivers. Driving will test campers’ hand-eye coordination, their ability to listen to and remember instructions, and will be early practice for their driver’s license tests!